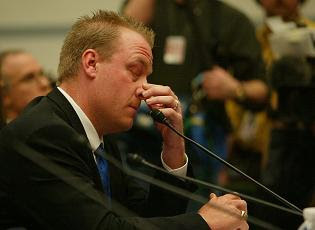 Curt Schilling, of the Boston Red Sox, has called on Roger Clemens to clear his name or give back four of his Cy Young Awards. In the Mitchell Report, Senator Mitchell claimed that every team in baseball had a steroids issue, that no team was exempt and there were “no doubt” more players involved than named in his report. So why would Clemens have to give his Cy Young up to somebody who very well could have been on the juice himself? In the post Mitchell-Report era it would be unfair to take away records, Cy Youngs, and MVPs from individual players without finding a way to absolve everyone not linked to steroids, since most players are feebly linked to steroids anyways. A better way to handle it may be to put an asterisk next to everyone’s name in the record books from Lenny Dykstra to the last player off the field before MLB instituted steroid testing in 2002. Go to Hot Stove New York for more NY sports news.